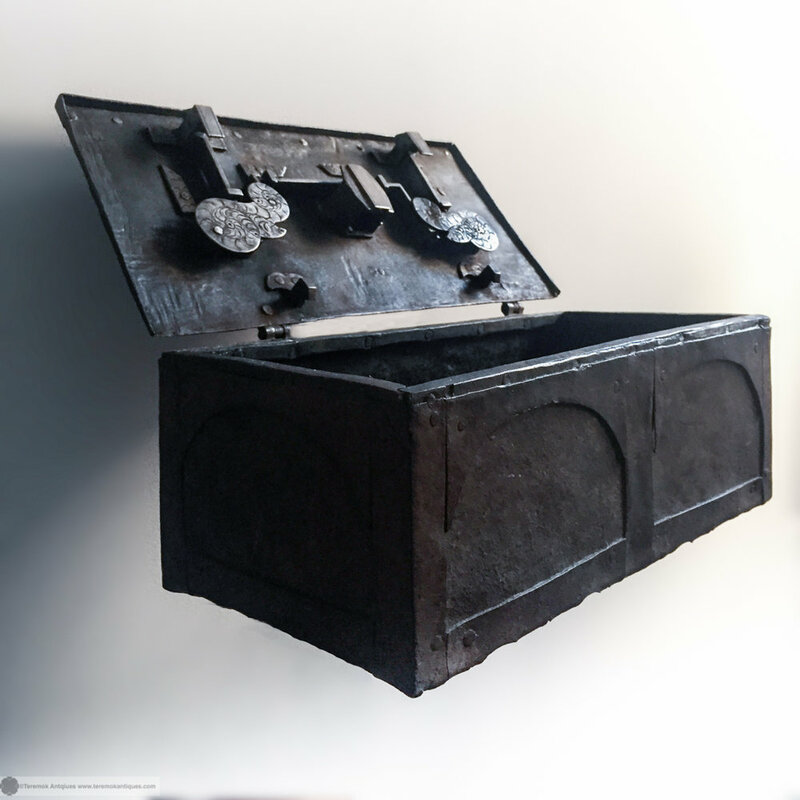 Bavarian iron-mounted softwood casket, the hinged rounded lid with loop handle, iron-studded corners, traces of asphalt or beer colors, three wax seals on the lid, one inscribed "König ... München" with the Bavarian coat of arms surrounded by laurel wreath. The seals are in rough condition, see photographs, but fully attached. Minor cracks, scuffs, discoloration, removed felt from base, missing inner panel of wood. Overall condition is good with solid joints and no loose parts. Totally original not even cleaned. No restoration. The type of construction can be dated to the second half of the 18th century. The kingdom of Bavaria was created in 1806 and lasted until 1918. It would make sense that an older casket was used to transport documents belonging to Maximilian I. Joseph., the strings were cut, the seals remained on the casket. The coat of arms on the wax seal is very similar to the coins of that period. 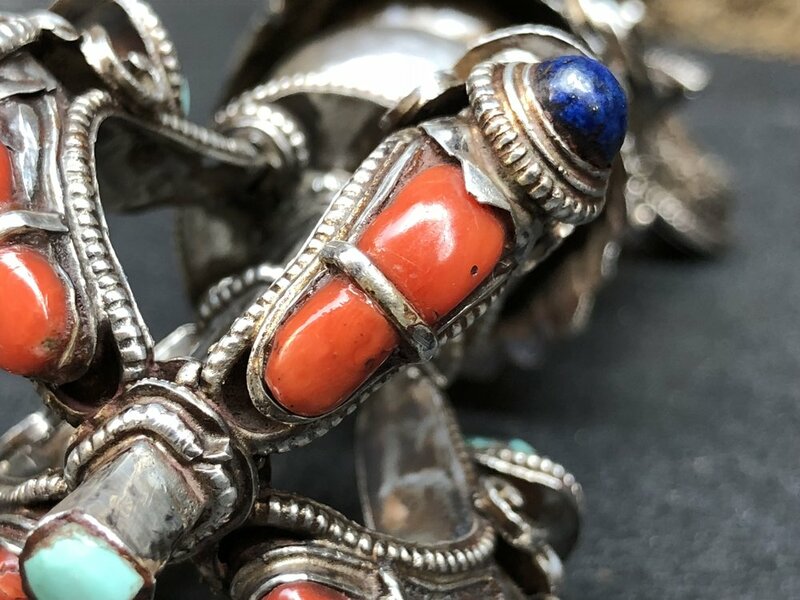 19th Century Jarao Work Casket with Tinted Glass Gems, Pearls and Semi Precious Stones. 15th Century French Gothic Tracery Panel. 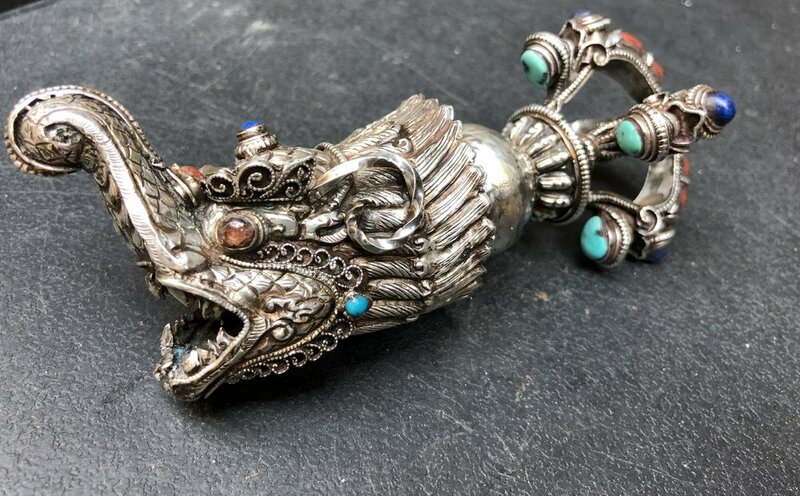 Silver, lapis lazuli, coral, rock crystal makara vajra ritual object. 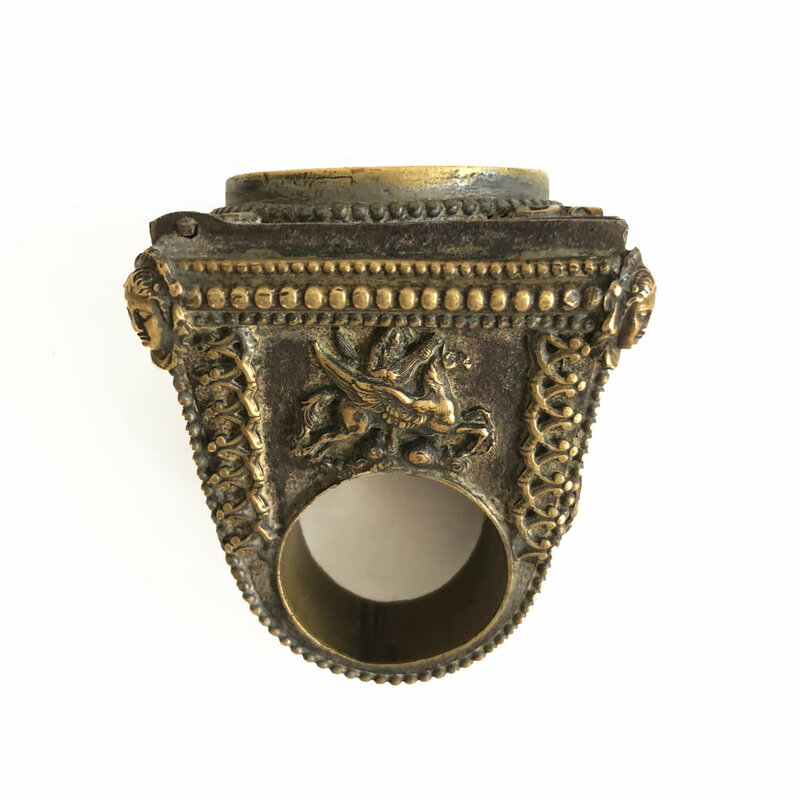 Rare 19th Century "Papal Seal Ring" with secret compartment. 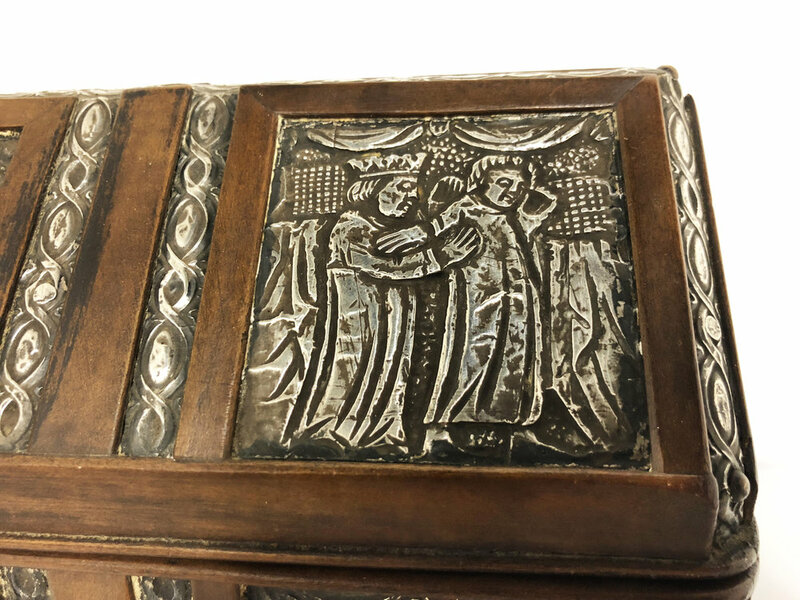 Unusual Snuff box with image of "Christ in Majesty"
Exquisite detail displayed on this extremely high-quality casket showing the influence of Dutch chest design construction during the 17th century. The carving on this casket displays a truly masterful execution of wood working skills. Solid ebony and very heavy for a small wooden casket. Similar examples were created along the Coromandel Coast, Batavia, and Ceylon (Sri Lanka). Missing the catch for the lock, lock is without key, top panel is split but stable. Minor old repairs. This is a very rare item. Consisting of a pair of portraits, 6.5in diameter each, facing one another and pastiglia plaster with gilding throughout and various armorial coats of arms and shields including that of the Tolomei Familily and Siena. Dated on front 1521 in Roman numerals. Likely later, 19th century. 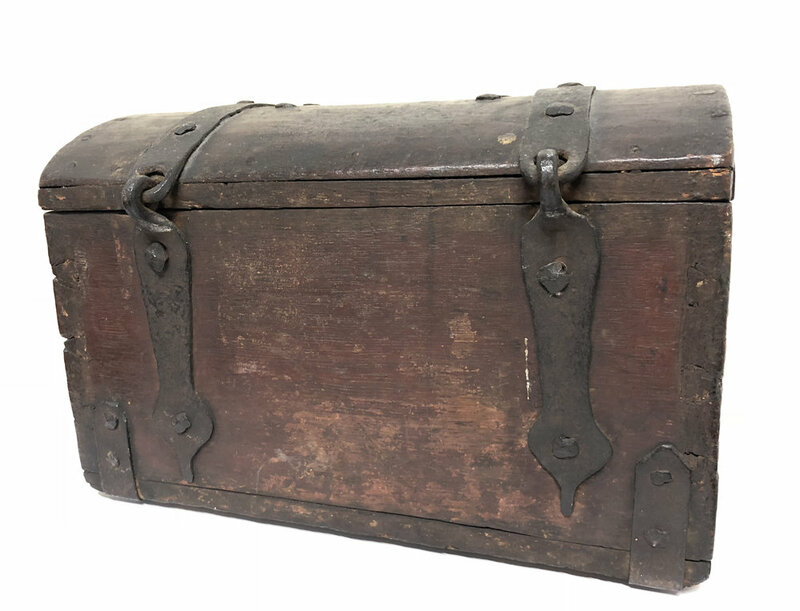 26.5 l x 11.5 d x 12.5 w.
Very rare Russian chest or box made from lightweight bent wood. This piece dates from the late 17th Century or early 18th. Produced in Great Ustyug. Traces of the original mica and parchment are still underneath the pierced iron escutcheon. The construction of the body of the box is cleverly 'sewn' together with a single band of wood joined with thin wooden strips. 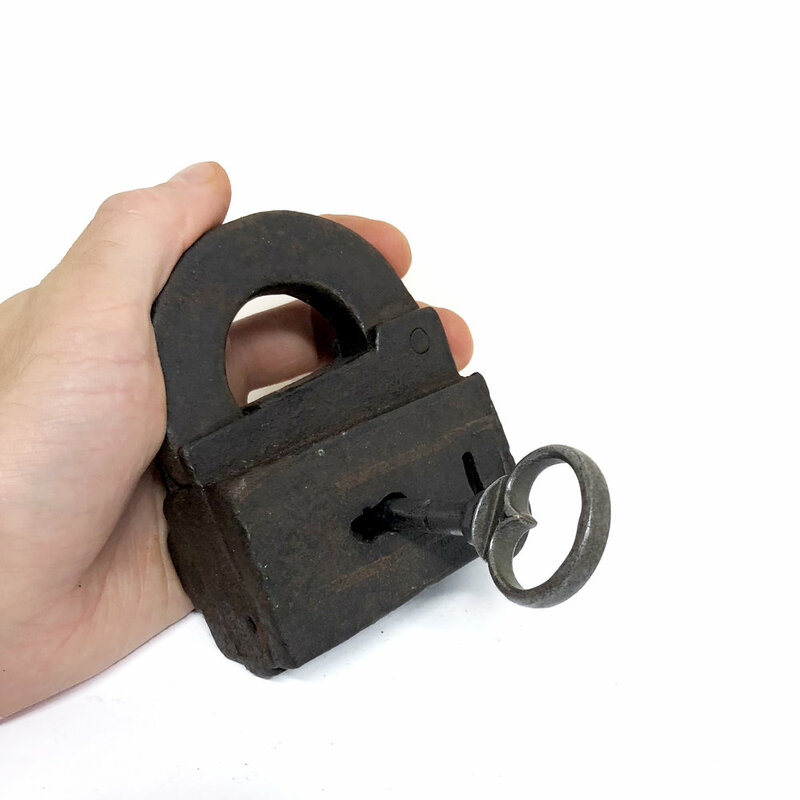 The lock is intact, but there is no key. Original unfinished wood. There are a few repair nails added but overall the entire piece is intact and original. Interesting workmanship on the bottom. See photos, some metal missing from straps and handle. This is not to be mistaken for a Swedish bent wood box or other. It is a very seldom seen type of Russian box. 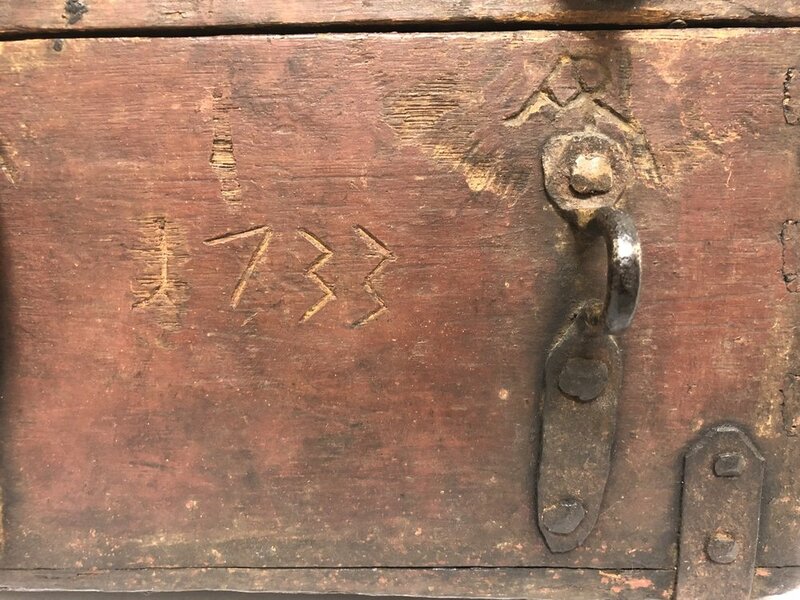 17th - 18th Century German Strong Box or Armada Chest with Rare Matching Pair of Miniature Padlocks with Original Keys. 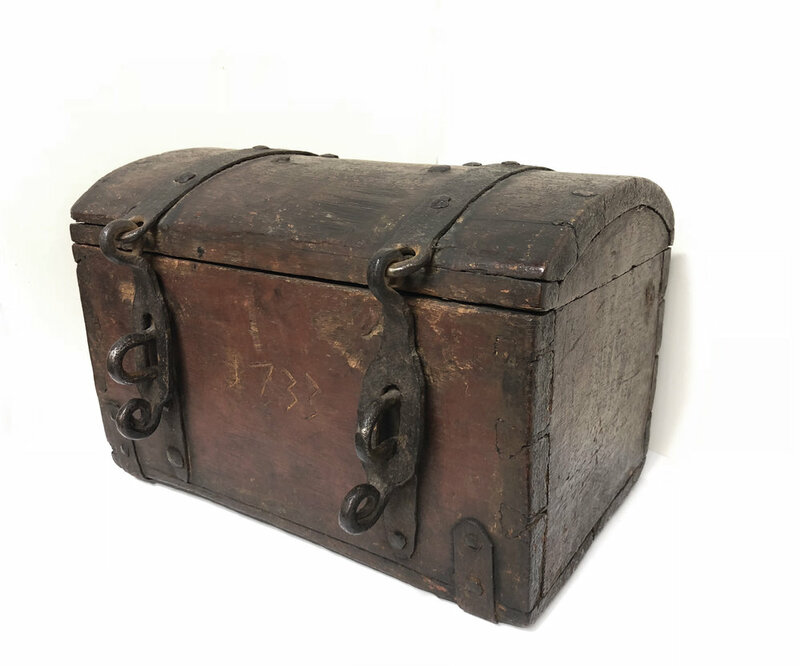 This is a fantastic German strong box, coffer or armada chest in a rare small and portable size. This piece was produced by artisans in the 17th or 18th century. 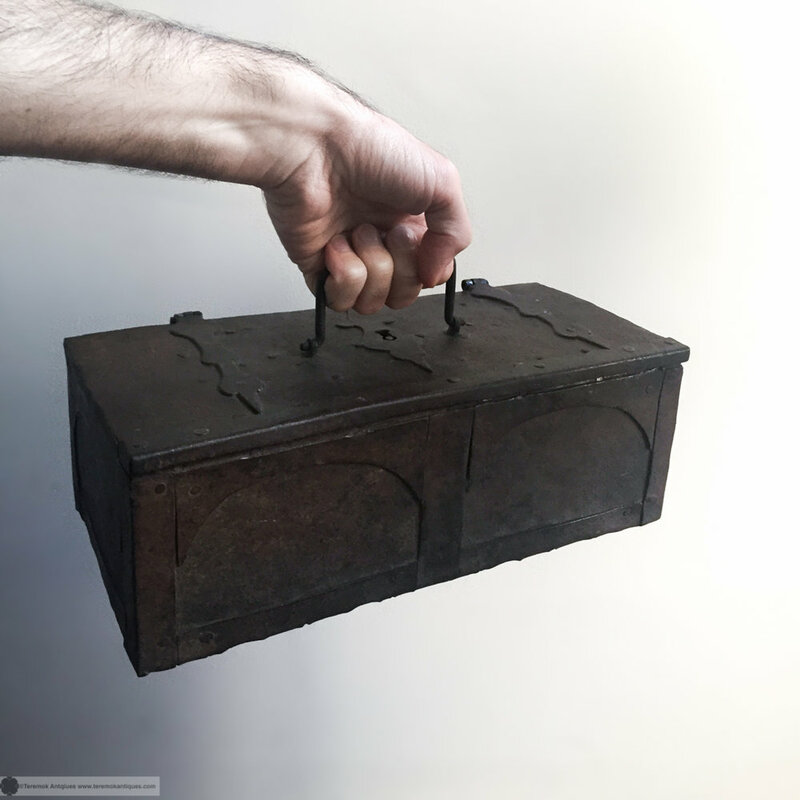 Originally used to store precious objects, money, and jewels. 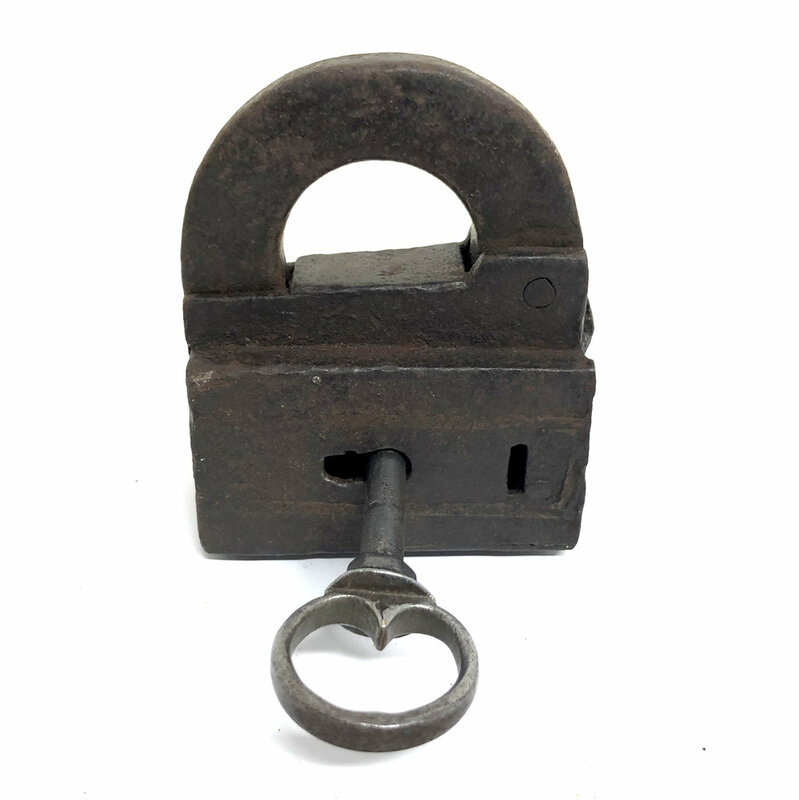 What makes it particularly special is the matching pair of associated 17th -18th miniature steel padlocks. Nearly identical, and certainly made by the same craftsman, this small matching pair fit perfectly on the box. Being steel, they differ in the patination found on the iron box. The overall condition of the box is structurally excellent. The interior, once painted bright red, still has the original pigment. The exterior has long lost its original paint and does have some surface rust. Traces of the gesso coating are still present in the crevasses. Gesso would have been applied and a top color or even a painting would have been applied after this. 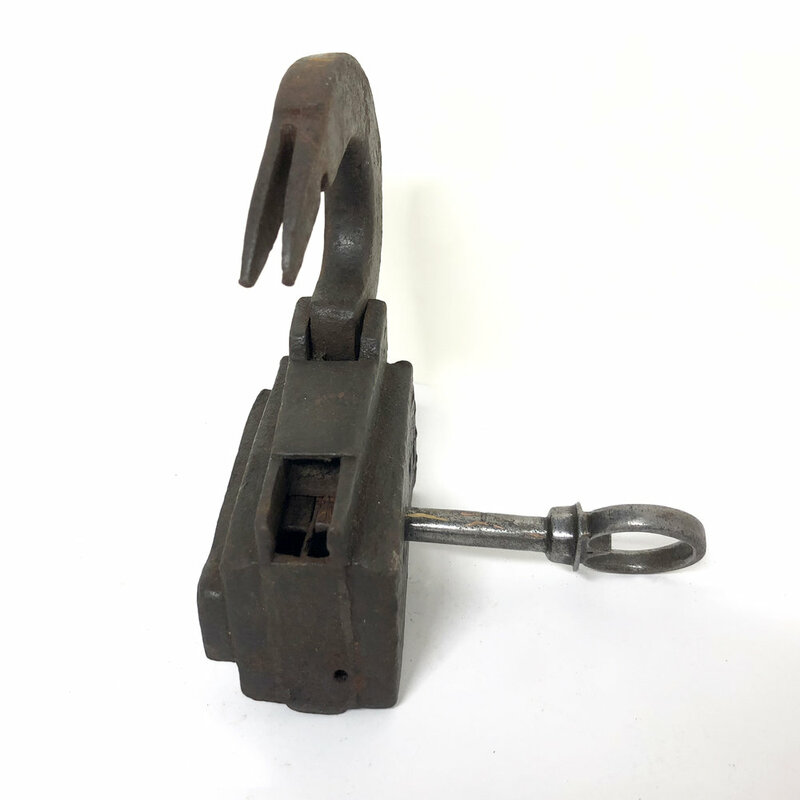 The surface rust, which is minor, is easily oiled and wire brushed off, but I leave this as a choice for the new owner. I've photographed the box in morning light to show its detail of color. 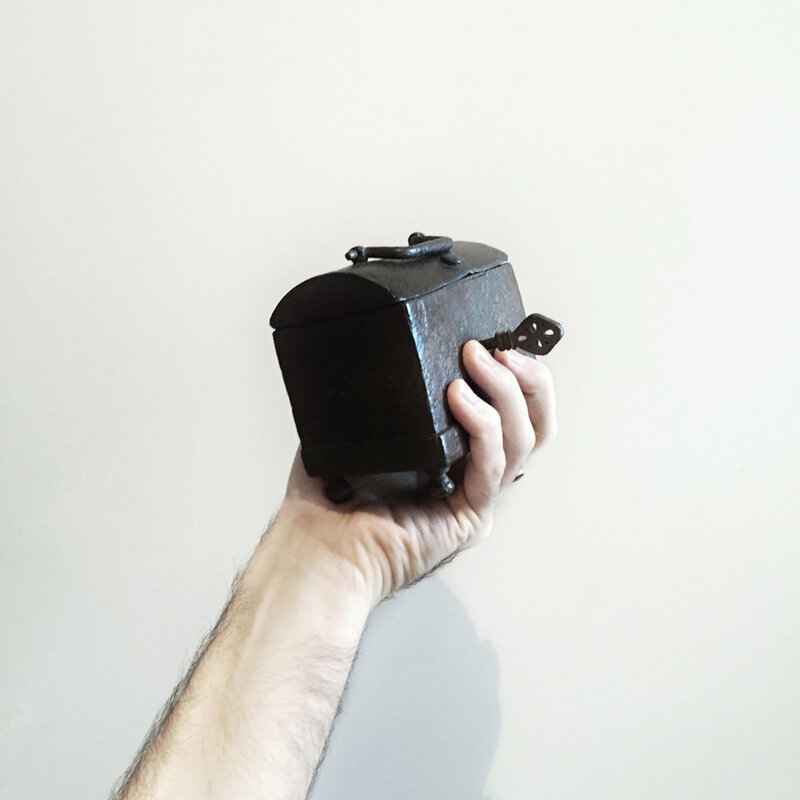 The overall box presents wonderfully, with rich dark tones and interesting metalwork features. 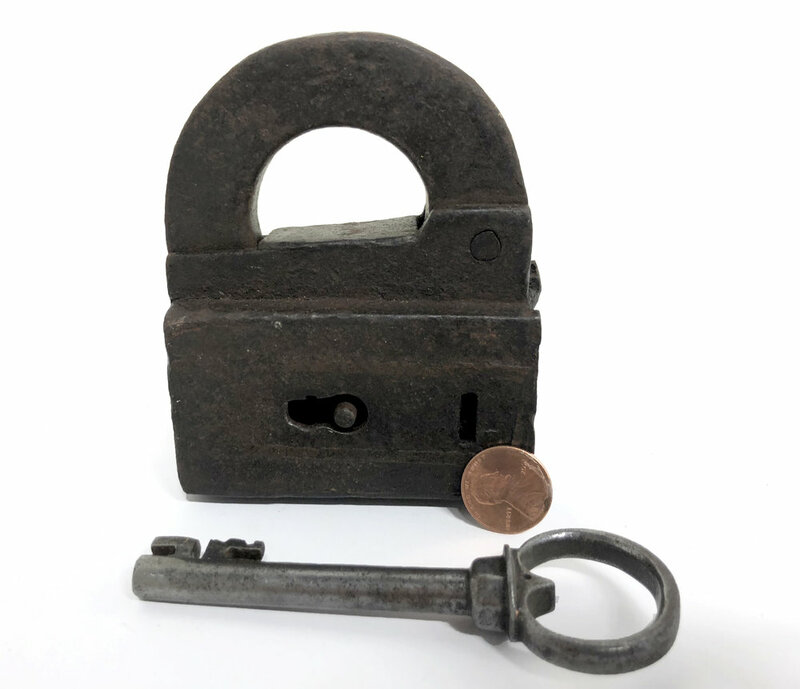 The interior built in lock works, the key appears slightly bent and looks to be antique, but 19th century. The box measures. The locks measure about 2in tall each. 12 3/4 in long x 6.5 d x 5.5 in tall. padlocks approximately 2in tall. Fantastic, gilded and small in scale. 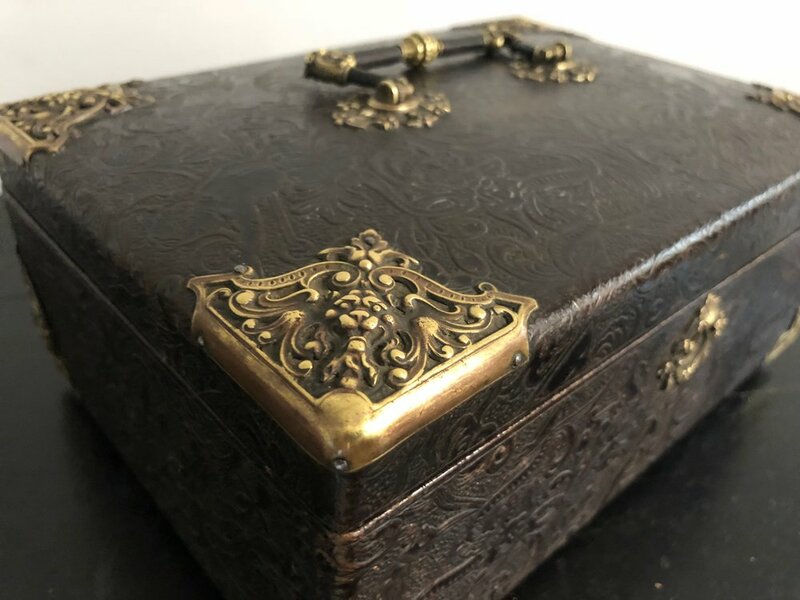 Victorian Stationary Casket or Box. Wonderful Victorian stationary casket with blue satin lining. Nickel plated brass hardware atop a faux leather textile in a light brown. Lovely piece. Heavy and sumptuous brass casket. Turn of the century "cairoware" or Mamluk revival ware. 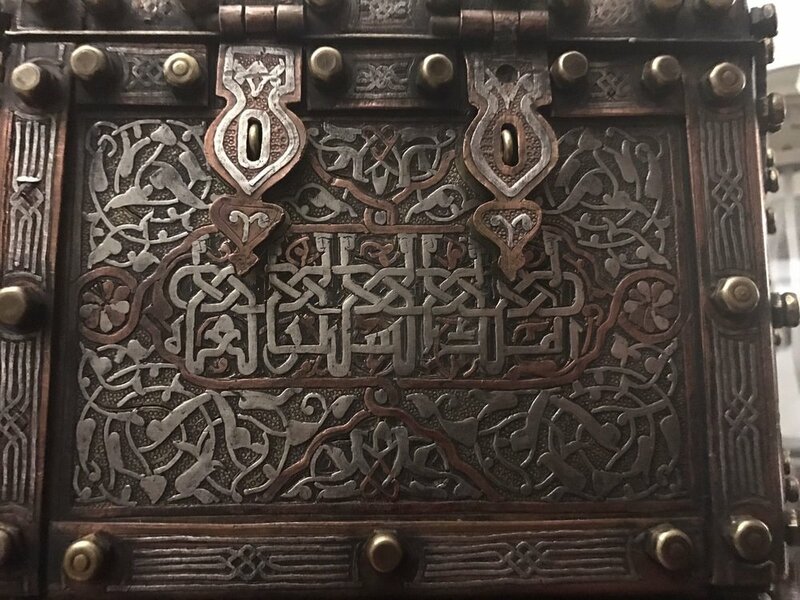 Inlaid on all sides ( except bottom) with Arabic script with inlaid copper and silver. Lining looks replaced. Mamluk Cairoware Revival Casket Inlaid with Silver and Copper. 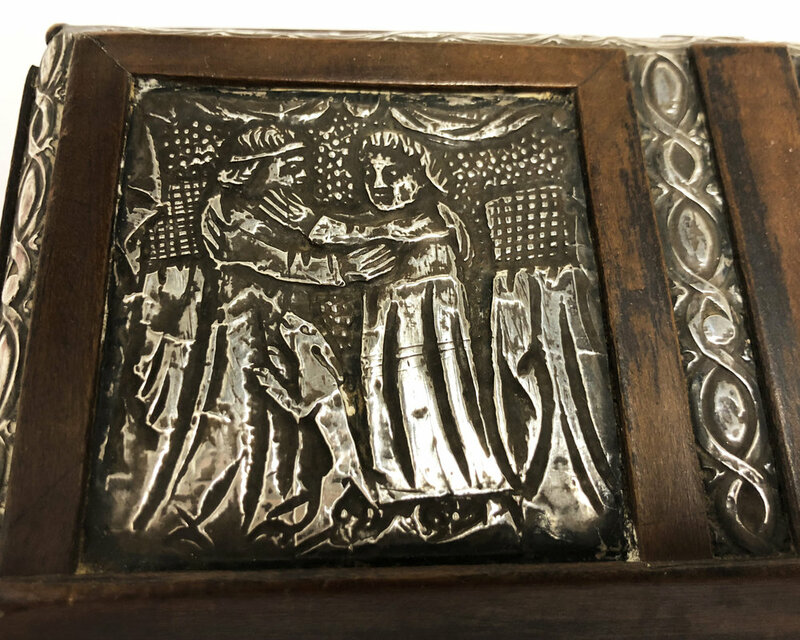 Rare and exquisitely made casket or box featuring wonderful verses and designs throughout. Heavy, substantial and very unique. 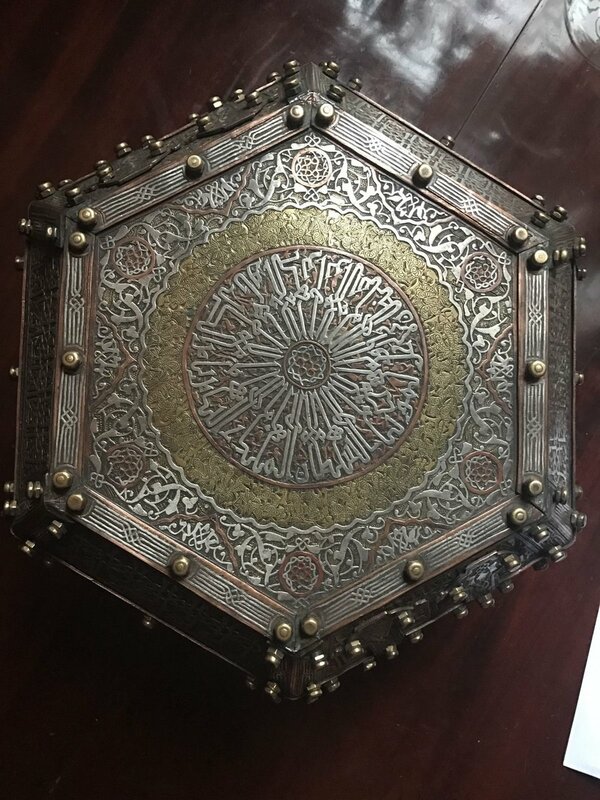 Fantastic and highly ornate silver, brass and copper casket in a hexagonal form. Detailed on all sides. Circa 1910. 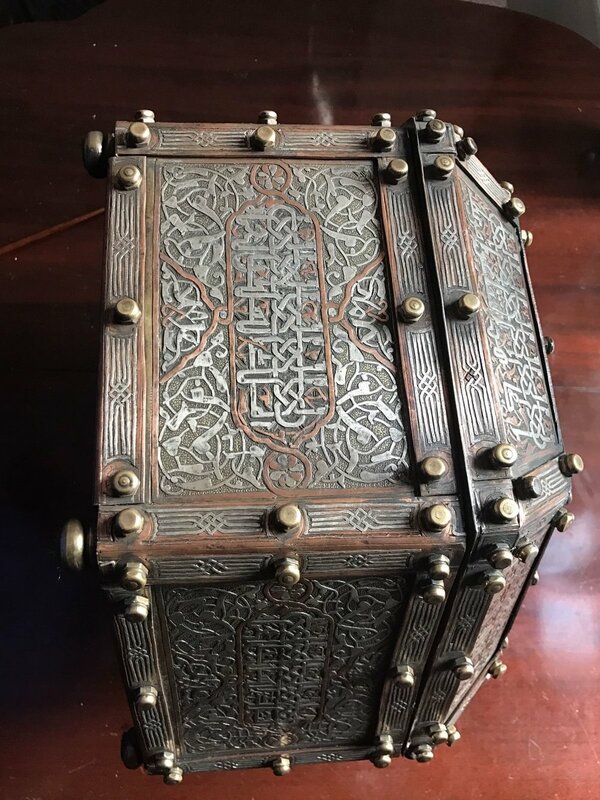 Mamluk revival cairoware box for The Quran. Qajar Style 19th Century Brass Casket. France, made for the Qajar export market. 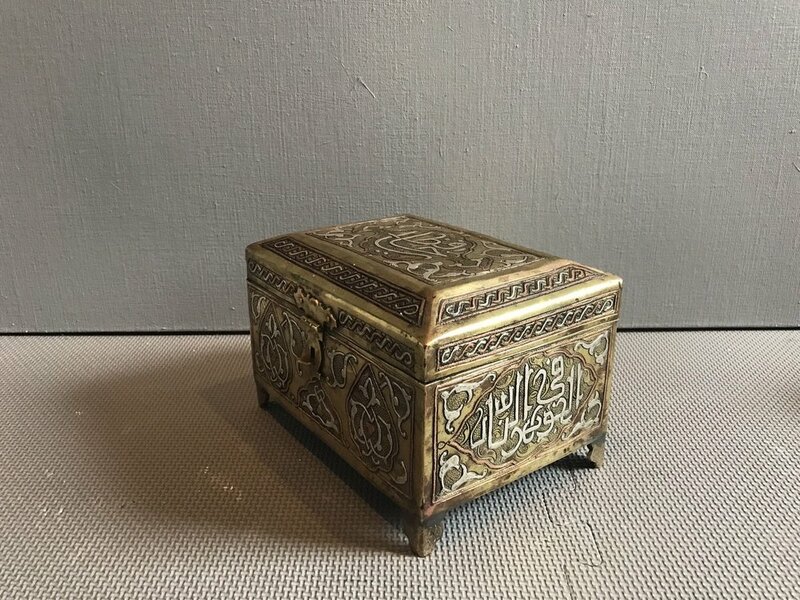 Special and wonderful brass casket made in France in the 19th century for Qajar market. Beautiful Persian designs abound with figures and beasts intertwined elegantly around the entirety of this heavy and substantial casket. 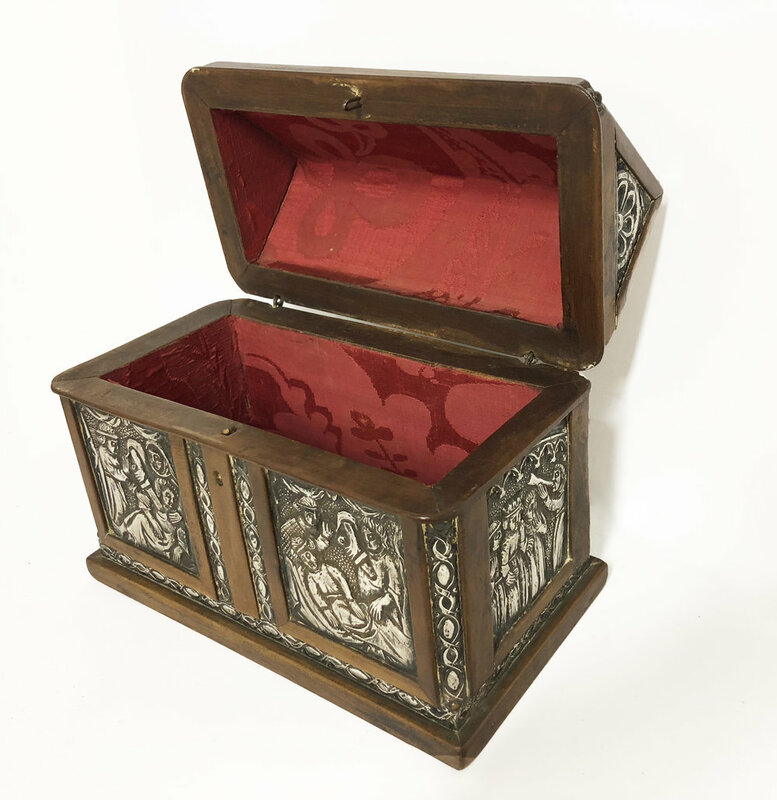 Lined with red velvet. . A wonderful scare item that is perfect for storing all your gems and jewels. This is a heavy and substantial piece. 7 w x 4.5 d x 5.5 t in. Baroque Iron Strong Box. Possibly Swedish, 18th Century. Eighteenth century iron casket, hand forged. Likely German or Swedish. Former Seward Kennedy collection. Missing key, but lock is intact. 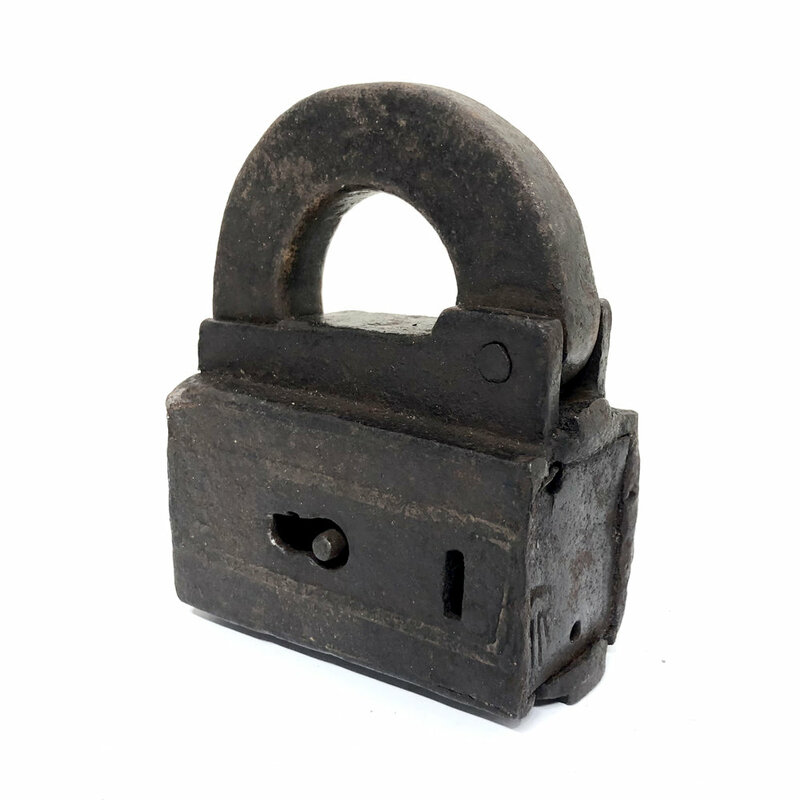 A wonderful piece retaining its original dark and pleasing patina. All hand forged and riveted together with decorative flourishes on the sides. Sticker on the underside of lid was there when found, and since it is not a price tag but possible a collection number, it's been left in place. Repoussé Brass Arts and Crafts Period Casket or Gothic Revival. 19th Century. There are stylistic elements of this French 19th century casket which evoke the brass and enamel caskets produced in Limoges in the 15th century. The peaked lid and gothic motifs point to this. There are elements to this piece which suggest the influence of Arts and Crafts moment artists such as Alfred Daguet. 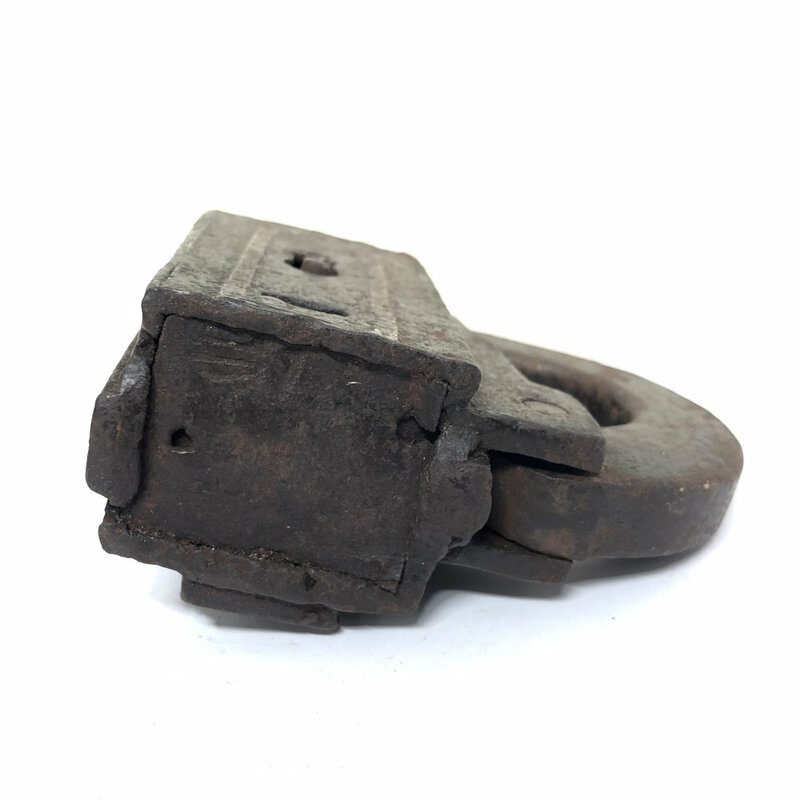 16th Century Continental or English Church Offerings Coffer with Three Locks. 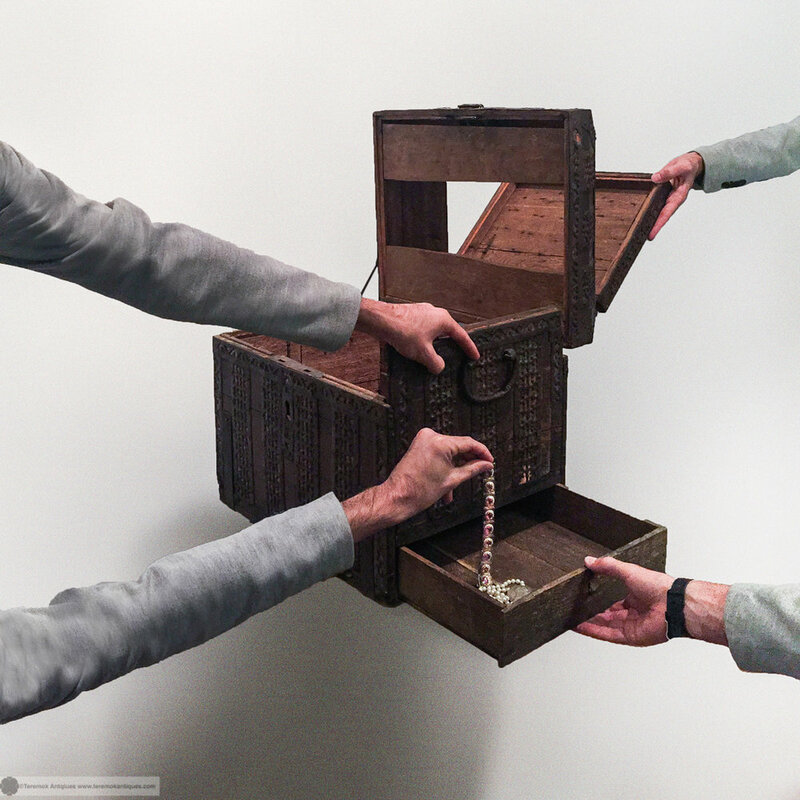 Originally three people would need to be present to unlock the three unique locks on this stunning coffer, assuring accountability. 19th Century Japanese Burled Mulberry Rooster Box. It's the year of the rooster. This magnificent box is is crafted to perfection, with each piece being thoroughly hand carved and detailed. Just listed, more details to follow. Contact for more info. 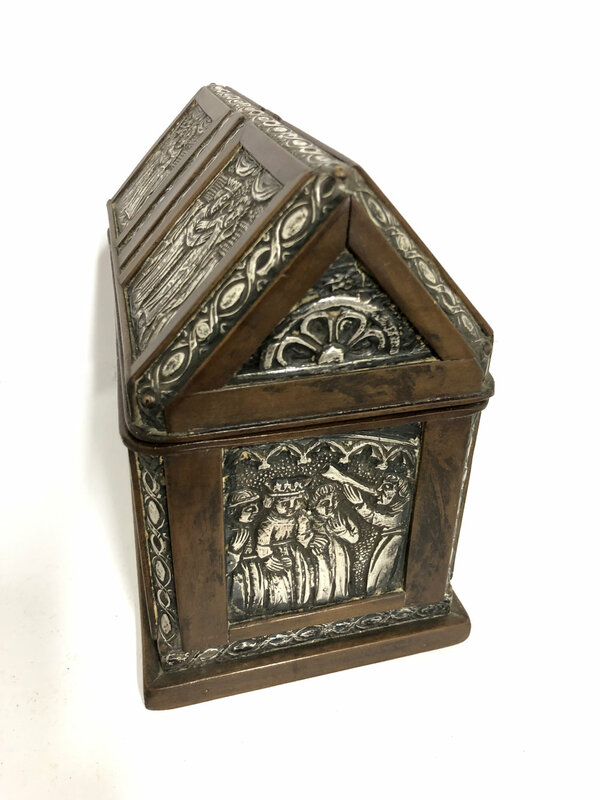 Fantastic and very rare hand forged iron box or casket for valuable objects such as jewelry, coins or other precious items. 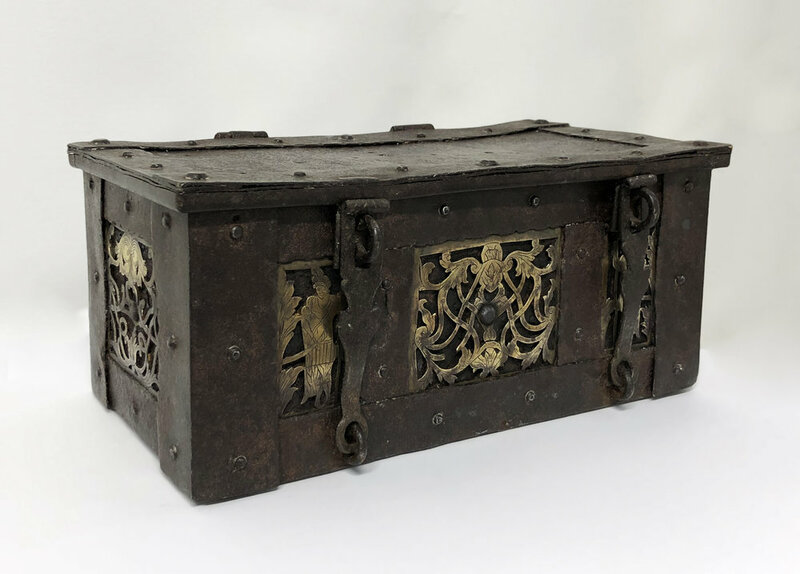 This heavy and solid box or casket is made entirely of hand forged iron. Just imagine the labor that went into this object. It is substantial and extremely well made. Dating from the 16th-17th century and entirely intact. The key is a hand-made replacement (not a cut blank to fit, but a completely made key). 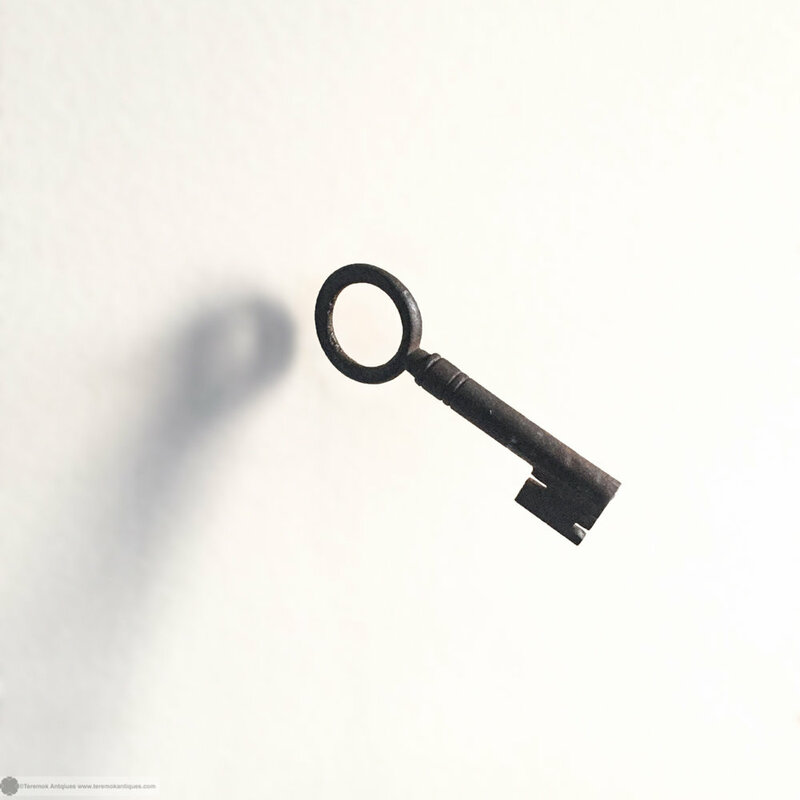 The lock opens with the key at "3pm" when inserted into the horizontal keyhole. 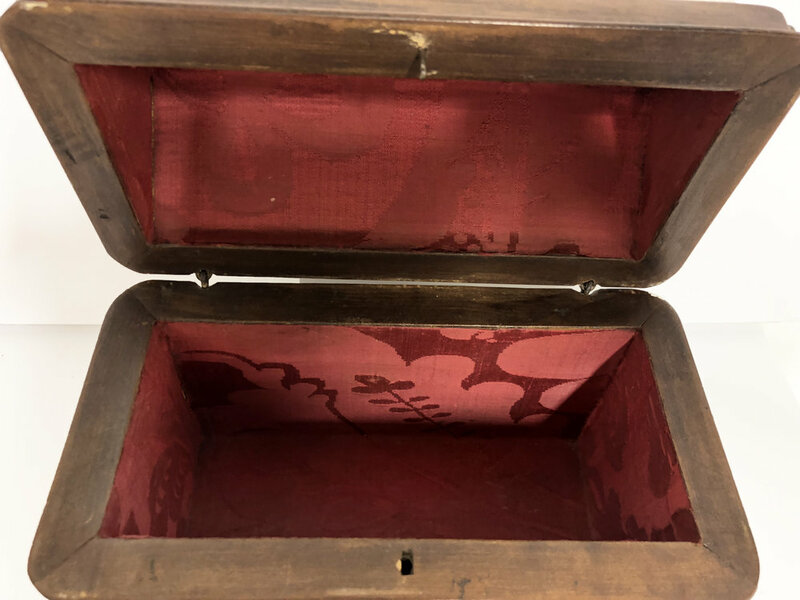 There are faint traces of red pigment on this box. This would have likely been made in Germany, possibly Nuremberg, the metalsmith capital of Europe at the time. On the lid there are some deep chiseled letters, at least " S M" and possibly an "A D" followed by now faded markings. Likely a date? Possibly an abbreviation for "anno domini, which might have been used to identify the birthdate of "S M". There are obvious signs of age, there are two chips on the back right and left corners of the lid, pictured. 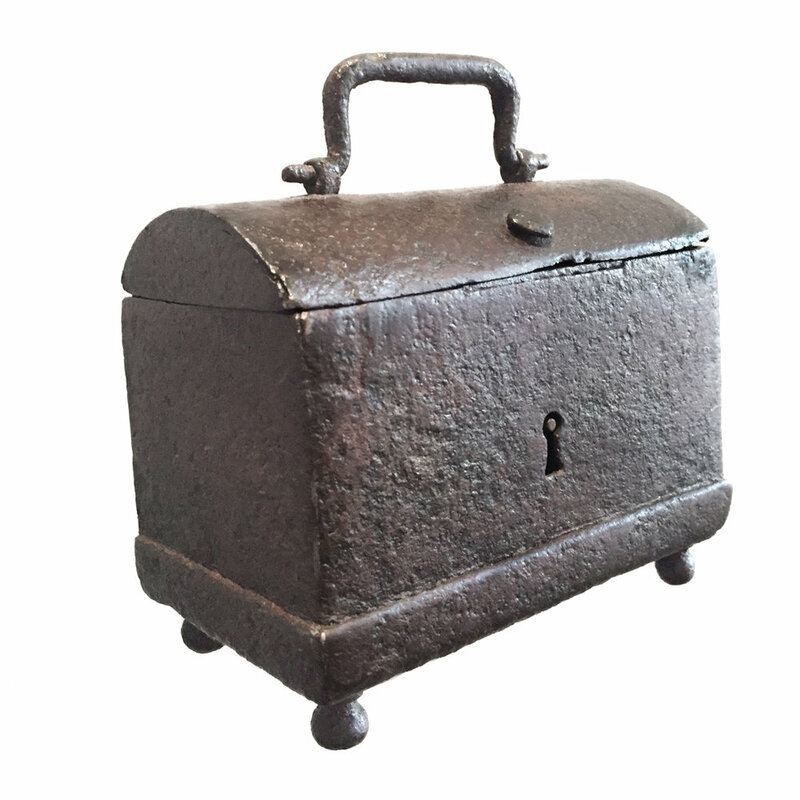 Scarce Hand Forged Domed Antique Casket, 16th-17th century with original key. This is a fantastic piece. 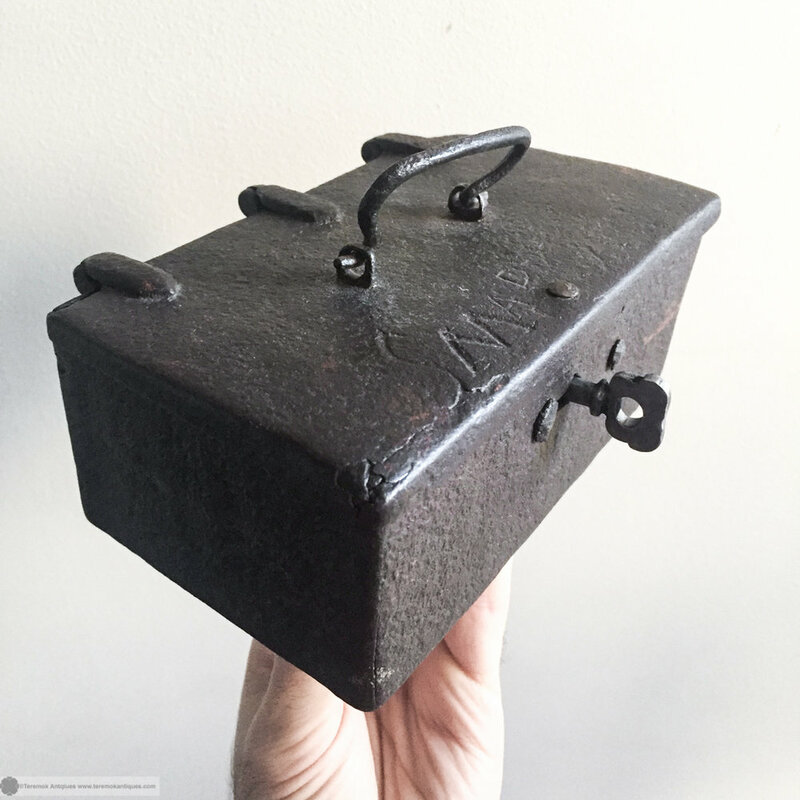 A solid hand forged iron box or casket for jewelry or other small precious objects. 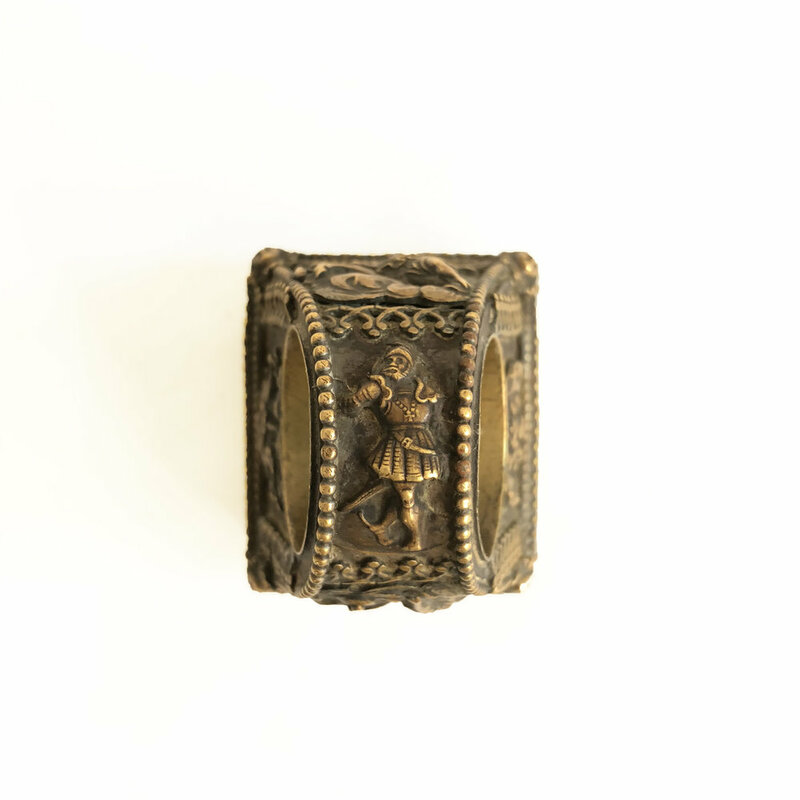 The small is less common and the size of this antique metal box makes it very pleasing to hold. The patina is rich and soft. The original key works and the box closes tightly. Truly a wonderful object. Armada Style Coffer or Casket, German, 17th Century, Probably Nuremberg. 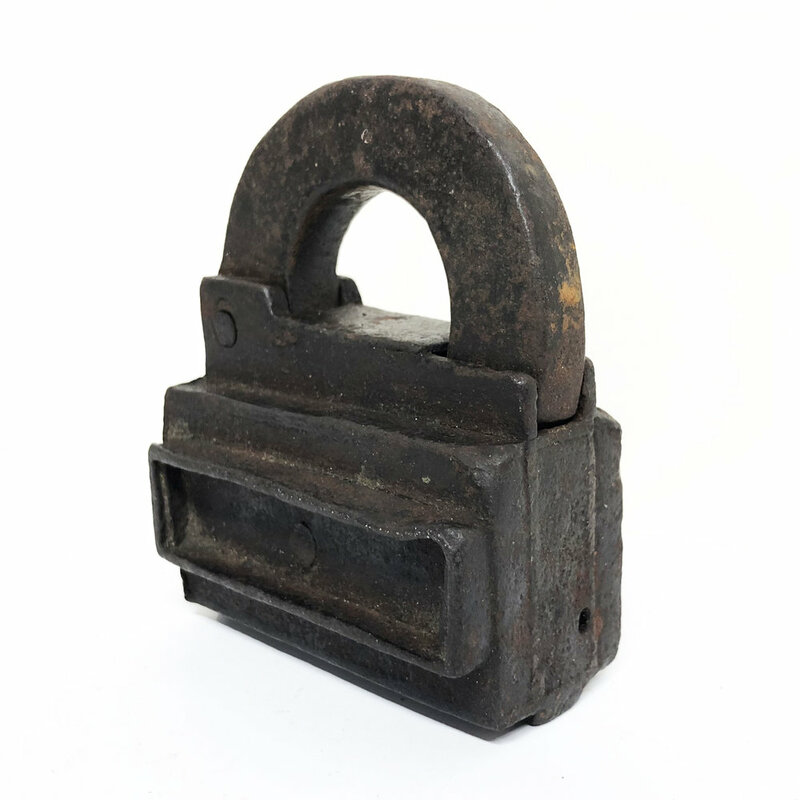 This wonderful hand-forged iron box has a double locking mechanism, whereby the single key operates two separate bolts in one turn. 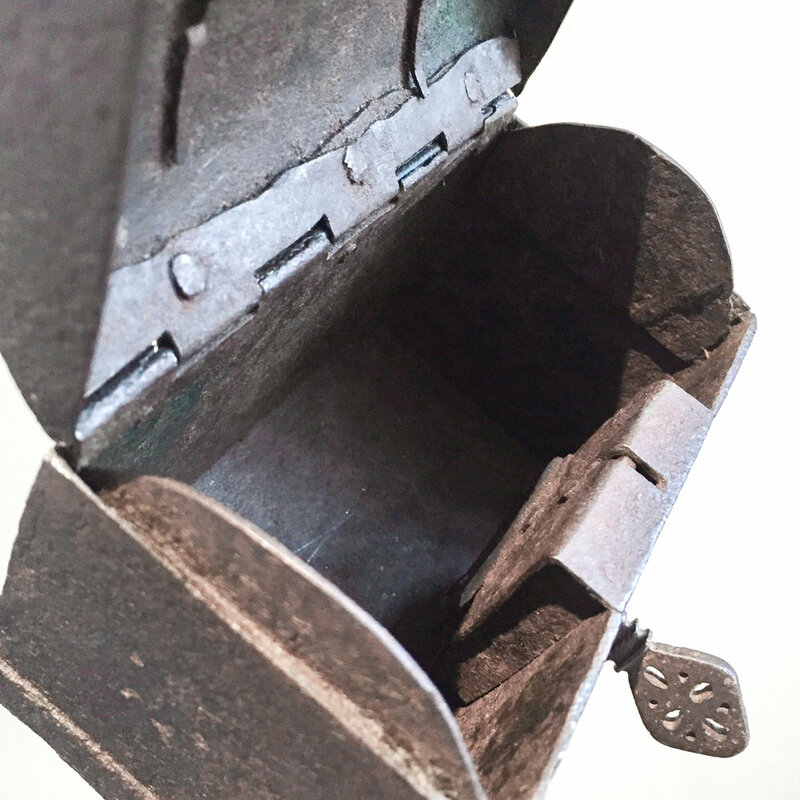 The box would have been originally made entirely by hand forging the parts together with rivets. Essentially an antique safe. 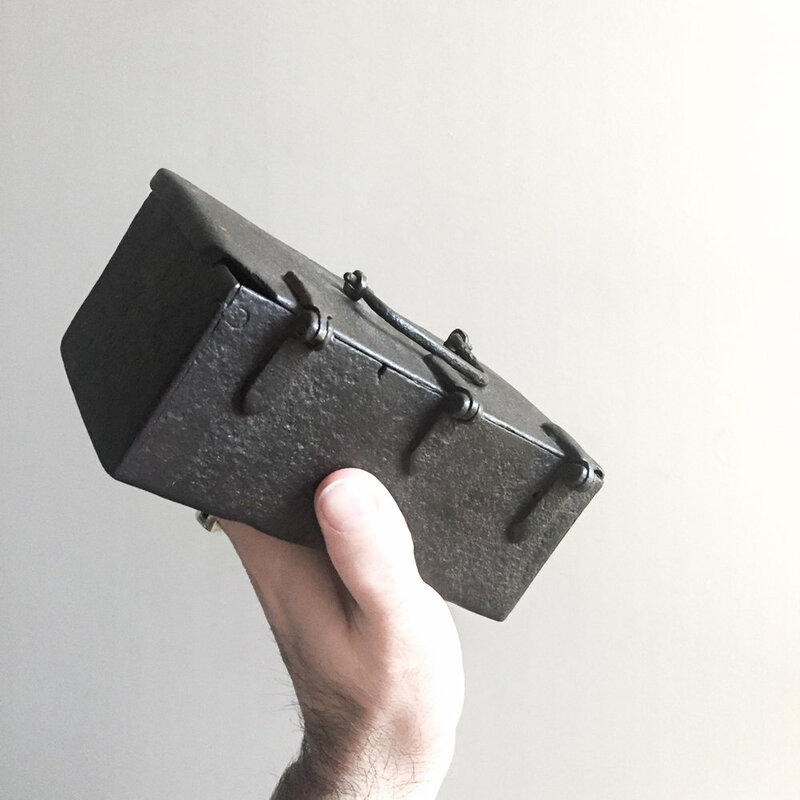 These kinds of strong boxes might have traveled the world over on Spanish Armada ships. The piece is heavy, solid and in amazing original condition. 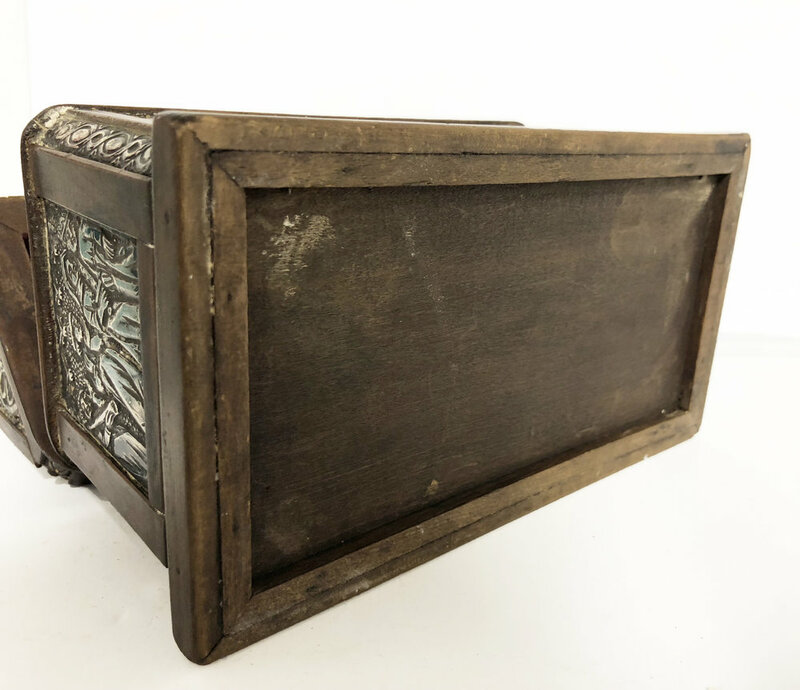 This coffer would have held valuables, coins, gold, silver or jewels most likely. Still fit for treasures today. The patina is intact. The key is possibly a replacement. 12 L x 4.25h x 5.75 t inches. Rare Antique Russian Coffer or Casket, 17th Century. Incredible Russian coffer or casket with secret compartment. 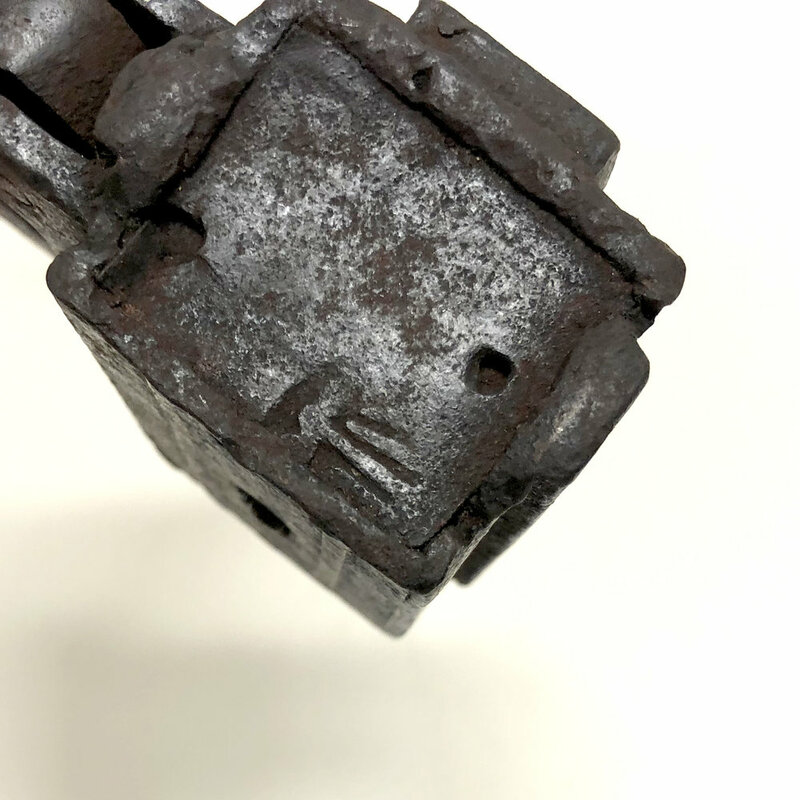 Iron bands atop traces of mica backed with pigment. Very rare.